55 posts in this thread. I'm using 2014.5 in earnest now and like the new hairpins--it should be a big time-saver. But what do you all do about collisions with dynamics? Do you anchor them to the beat and then adjust the endpoint(s) by dragging, with the arrow keys, or...? I would like the adjustments to be consistent. Is there a JW plug-in that helps? Alas, there doesn't seem to be a dialog box where one could type in numbers (akin to expressions' assignment). I always use these = Settings: Edit: Movable Items: both de-checked. Octo, what does that setting do? These settings allow you to drag items only at one direction AND that the items are kept attached (anchored). I still don't see how JW can help. If you have "subito pp"<"molto ff"
I am quicker with mouse than with programming JW. But, I might have wrong. Thanks, that's good to know! You must mean to have them checked though, I had them unchecked antil now and I always use shift to constrain. Fantastic. I should have changed this setting years ago! Thank you again! In your case JW might not be much of use. 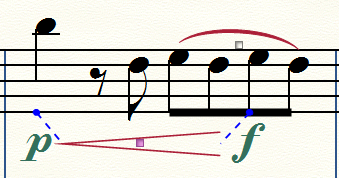 I work mainly with 18th century music so I rarely have anything else than just standard dynamics. I have set up macros so I really do not go into JW manually, just select and press some keys. Does it for me. Thanks, that's good to know! You must mean to have them checked though, I had them unchecked antil now and I always use shift to constrain. Yes, I mean CHECKED, sorry for confusion. You might edit your posting above--it was confusing. But the second one is checked by default, and I always start by attaching the hairpin to the first note, so what you describe doesn't happen to me. What I seek is something like "move the start right N EVPUs for p, M EVPUs for mf, and the like, rather than just eyeballing it. I will ponder Harpsi's thread on JW Change. I use JWChange for something very similar. I regularly run a sequence to extend the endpoint of a bracket smartshape over a set of notes x no. of units to the right. At the moment I have to use 2 different sequences depending on whether the final stem is up or down, since I can't figure out if I can make the Change program recognize that variable (I think not). It has made a world of difference, since I can copy the shape to an analogous other place in the document and the spacing is respected. That's why I am not considering getting 25.2until the JWChange plug in is available for 64 bit. The plug in is so powerful and useful. JW Pattern is a useful Tool. There's even a test version for Finale 25. There's even a test version for Finale 25. When the p and f has been input, I select the area for the hairpin, press <-shortcut, then press shortcut for adjusting left offset, then for right offset. The various offsets for dynamics have been setup in JW Change by using the sequence editor. In this way it is easy to make a macro for them. See attached GIF (it is animated). I anyone is interested, I'll be happy to post the AHK scripts. This image has been viewed 218 time(s). This image has been viewed 228 time(s). Yes, please! I guess screenshots of the JW Change sequences, or at least a sample, would be good, too. It is great that you use that way, but I do the same by manually dragging. I do it for consistency. And for being able to do any number of staves simultaneously. Absolutely. No matter how carefully you eyeball, that's not going to be consistent. I await your scripts with bated breath. but I will repeat it all here. Just one note, the trigger key § works well to use on my swedish keyboard. You can of course choose another one. there is a script that Jari Williamsson made that lets you script his plugins. When I press § the system waits for another keypress. §< will make a cresc, §z a dim. So in action I highlight (in Selection Tool) the place where I want the hairpin/s to go, press key combo, done. Let's take p as an example. So the trigger key waits for "u" to adjust the left side of the hairpin, or "j" for the right side of the hairpin. As you can see, the script is not very sophisticated. It opens JW Change and then sends a number of keystrokes to access the right sequence in the group (list) of sequences I have prepared before. The sequence for §+u just contains one action: Hairpins/Left Offset - Horizontal: 40, Relative: No. The sequence for §+j is: Hairpins/Right Offset - Horizontal: -40, Relative: No. I hope that should get you started, let me know if it works for you. In my line of work, this is much more efficient than adjusting with the mouse and then copying to the other staves. The advantage of drawing the haripins with the mouse is obviously that you get it at the right horizontal level at once - I almost always have to adjust that after. To each one his own. Well, that is SOMETHING. Very good indeed! Thanks for sharing. Most excellent, Harpsi--thanks so much. I had to modify things slightly because JW Pattern conflicted with JW Pattern Copy in the menu selection but I finally got it to work. This opens a new world of being able to invoke the JW plug-ins with hotkeys. Why didn't you invoke JW Change via the openJWpluginwindow mechanism? The second argument to openJWpluginwindow is something I added, so wouldn't apply to you. Or maybe you'd need it, since there's a JW Change Pitches. Let me know if so (I modified Jari's code slightly). I tried invoking the hairpins/left offset directly, but setJWpluginpanelvalue doesn't seem to work for some things. I'm glad you see the use of it! I had this problem too, I believe I solved it by moving the JW Pattern Copy out of the JW folder. Actually I do not remember exactly as this was some time ago. I think I tried via JWs mechanism but could not get it to work. The keypresses/sequences method works OK, but if you find a way of doing it differently with openJWpluginwindow, it would be interesting to see. Thanks Motet, I will try that and compare. Does not work for me... I get an error message if I run it exactly as you wrote it. I deleted the "JW Change" and it ran without error message, but nothing happens more than the JW Change window opening. No selection of sequences and no apply&close. Yes, I added an argument to openJWpluginwindow so that what appears in the menu ("JW Change..." or "JW Pattern...", e.g.) can be different from the plug-in window title ("JW Change"). This avoids conflicts between "JW Change Pitches" and "JW Change", for example. The numeric arguments also might be different, depending on how your sequences are organized. Perhaps Finale-jwplugins hasn't been used much. I think these changes are good, so maybe I'll try to get them to Jari somehow. I can attach the new version here for you if you'd like, though of course what you've been doing already works for you. I really appreciate your pointing me to this! I opens a whole new world, as I say, and should prove a huge time saver for other JW plug-in things besides hairpins as well.